First, two acknowledgments. The title for this post, "A Monstrous Regiment of Women in Charlemagne's Court," owes an obvious debt to John Knox, from whom I have also taken the title of this blog. Over the years I have taken a great deal of pleasure in reinterpreting, reusing, recycling, and subverting the title of his 1558 The First Blast of the Trumpet against the Monstrous Regiment of Women, a vitriolic attack on female sovereignty. But the title of this post is also drawn from Janet L. Nelson's wonderful essay, "Women at the Court of Charlemagne: A Case of Monstrous Regiment?" included in John Carmi Parsons's 1993 collection, Medieval Queenship. Those acknowledgments having been made, now on to the subject at hand, today's post. I suppose I could have titled it Charlemagne's wives, "wives," mistresses and/or concubines, and daughters, because Charlemagne had quite a few of each. Before going any further, though, I want to note his mother, Bertrada of Laon. If you learn anything at all of French history in school, you hear of Charlemagne's father, Pepin (and of his father, Charles Martel). For the record, Charlemagne's mother, Bertrada, was the daughter of Charibert of Laon and Giselle of Aquitaine. 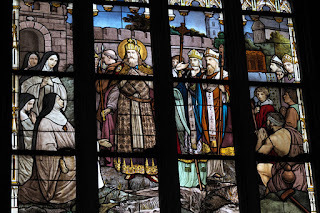 Although Bertrada "married" Pepin in 741 and gave birth to their first child, Charlemagne, in 743, Pepin was already married, to a woman named Leutberga, who was the mother of Pepin's five children. After 743, however, Leutberga either decided to retire to a convent or was forced to do so. Even so, the marriage of Pepin and Bertrada was still not recognized--they were too closely related in order for their marriage to be legal. But for whatever reasons, the obstacle disappeared after 749, and Bertrada was recognized as Pepin's wife--although, as Nelson notes, political difficulties in 751 and 752 "may have driven [Pepin] briefly . . . to consider repudiating his wife Bertrada and marrying again." After the death of Pepin in 768, his Frankish kingdom was divided between Charlemagne and his younger brother, Carloman, but Bertrada supported Charlemagne in opposing this division. The conflict between Charlemagne and his brother ended in 771, with Carloman's death. In the mean time, Charlemagne had "married" the Frankish noblewoman Himiltrude, probably before Pepin's death, and she gave birth to a son, also named Pepin, after his grandfather. The quotation marks I put around "married" when I describe Himiltrude's relationship with Charlemagne reflects some degree of uncertainty about their bond. Contemporary chroniclers offer their own views. Charlemagne's biographer Einhard, in his Vita Karoli Magni, calls her a "concubine," while the Benedictine historian Paul the Deacon, in his history of the Lombards, notes that Himiltrude and Charlemagne's child was born "before legal marriage." Pope Stephen III, however, in a letter to Charlemagne, referred to Himiltrude as his legal wife, and you'd think that the pope would be clear about this--but since he is involved in a political dispute with Charlemagne, he made have had other reasons for his judgment. 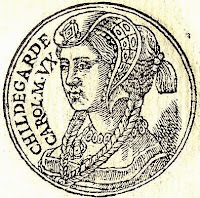 Modern historians are still divided, but Nelson assumes that Himiltrude was Charlemagne's legal wife. While married to Hildegarde, Charlemagne had at least two ongoing sexual relationships that produced children. His first known "concubine" (I hate that word, but I'll use it), a woman known as Gersuinda, probably dates to 773. Their daughter, Adaltrude, was born in 774. 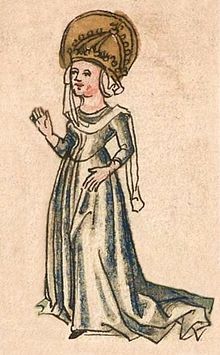 The second known "concubine" was Madelgard, who produced another daughter, Rhuodhaid, born in 775. Charlemagne married again about 784, this time to Fastrada, an East Frankish noblewoman. Einhard was not at all a fan of Fastrada, whom he regarded as beautiful but cruel--and, as Nelson indicates, Fastrada's cruelties "caused conspiracies and revolts," one of which was Pepin's 792 revolt against his father. Fastrada is known to have rendered a judgment in the case of a killing that had occurred in her Frankfurt residence, "holding court in a judicial . . . sense," and, in Nelson's words, "operating virtually as vicereine." Fastrada gave birth to two daughters, in 784 and 787, Theodrada and Hiltrude, and died in 794. Charlemagne married another Alaman noblewoman, Luitgard, probably in 794. Although she had no children, her "domestic" role--taking care of royal correspondence, distributing spoils of war to "deserving" churchmen, performing acts of piety and devotion with her stepdaughters--was also "political and public." So much for Charlemagne's wives and "wives." Notably, he had many daughters who reached adulthood, again listed by Einhard. Hildegarde's surviving daughters were Rotrude, Bertha, and Gisela. Fastrada's daughters were Theodrada and Hiltrude. 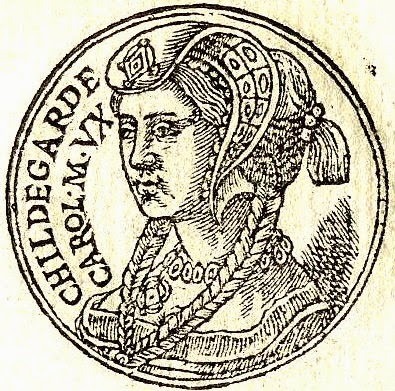 Three daughters were born to the women who were his concubines: Adaltrude (Gersuinda's daughter), Rhuodhaid (Madelgard's daughter), and a girl named Hruodhaid, probably born in 784 (her mother is unknown--in naming her, Charlemagne's biographer Einhard says the name of this woman "escapes me at the moment"). And after the death of his son Carloman, confusingly renamed Pepin, in 810, Charlemagne's granddaughters joined the court in Aachen: Adelheid, Atula, Gundrada, Berthraida, and Theoderada (Carloman/Pepin had married Bertha of Toulouse, and these daughters were their only children). Charlemagne's daughters and granddaughters constitute a "veritable 'regiment' of women," as Nelson herself recalls Knox's phrase, using the term here loosely as a synomym for a unit or company. She then asks, "What did those women do at the court of Charlemagne?" Among other things, they functioned as a kind of guard for the king--to get to Charlemagne, you had to pass through not only multiple doors, but through all these women. Well-educated, his daughters also participated fully in the cultural life of the court. They also participated in all the ritual and pageantry associated with the projection of royal power, including processions, feasts, and hunts. They traveled with Charlemagne, accompanying him on tours throughout his expanding territories. And, although Charlemagne's daughters had sexual partners and gave birth to children, none of them married. In explaining why they did not marry, Einhard says that Charlemagne loved his daughters so much that "he refused to give any of them in marriage . . . , saying that he could not be without their company." But Nelson describes something more than a father's loving attachment to his children. Charlemagne's many daughters remained unmarried as a matter of policy--the marriage of a daughter would have required lands and titles as a dowry, thereby reducing Charlemagne's territories and power. Equally, a daughter's husband and children would have been potential rivals to Charlemagne, challenging Carolingian succession. Unmarried, Charlemagne's daughters offered their father "political help within the household and the court." They were "channels" of patronage he could control, and sources of information he needed. They were capable and trusted advisers and supporters. They may have been powerful, but, in the end, they exercised no regiment--their power was informal and contingent. As daughters they were completely dependent on their father's authority. 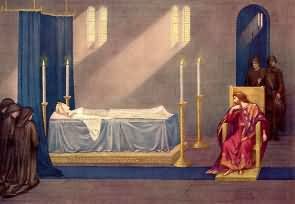 After Charlemagne's death in 814, they arranged his funeral and then disappeared. Or, rather, they were made to disappear. When Charlemagne's successor, his son Louis the Pious, arrived at the imperial court in Aachen, he found that, before he could begin to rule, he had to "chase out that whole female mob, which was very large"--in the words of Louis' biographer. The new king expelled and discredited his sisters and nieces, characterizing them as "whores," unable to deny themselves the satisfaction of "lustful heats of the palace," "seductions of pleasure," and "blandishments of fleshly desire." Hildegarde's daughters: Rotrude may have died as early as 810, before her father, or as late as 839; after 814, Bertha was sent to a convent by her brother; Gisela died in 808, before her father. Fastrada's daughters: at some date before 814, Theodrada became abbess of the monastery of Argenteuil, and she died after 844; Hiltrude died c. 800. 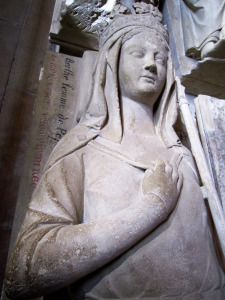 Nothing is known about Adaltrude (Gersuinda's daughter); Rhuodhaid (Madelgard's daughter), seems to have become the abbess of Faremoutiers and died at some point after 800; Hruodhaid (whose mother is unknown), died after 800. 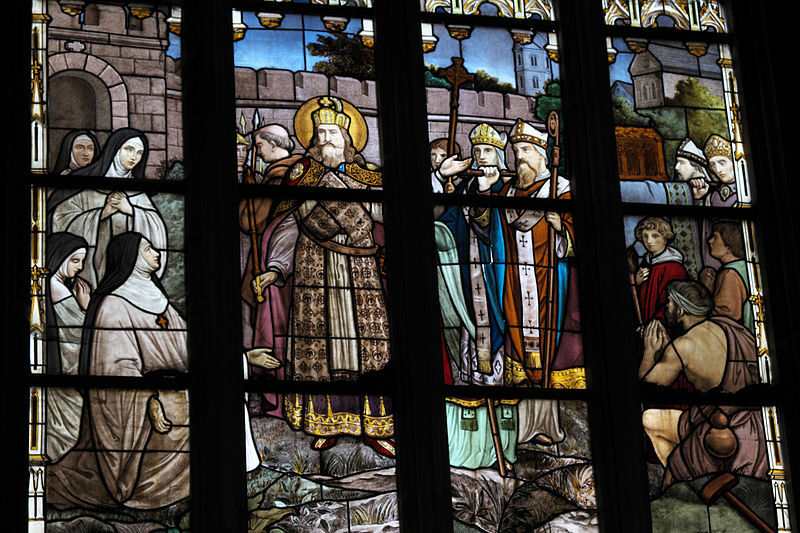 The ultimate end of Charlemagne's granddaughters is not clear. The eldest, Adelaide of Lombardy, seems to have married Lambert of Nantes and died in 810. The others-- Atula, Gundrada, Berthraida, and Theoderada--probably died before Charlemagne's death in 814.